You knew it had to be thanks to Hip Hop Vinyl and nobody else didn't you?! 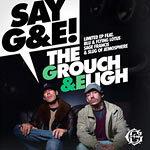 The German label has compiled eight select tracks from the album to form the Say G&E 12'' EP! It used to be that we hardly ever saw Legends vinyl coming out but now all that has changed! And as an added bonus, we are now offering the limited 7'' that came with the sales of the first 100 Say G&E CDs! So..that's two extra tracks to complete almost the full length of the album on vinyl, one of which is a non-album cut!